If you're getting a little bored of your wardrobe or find yourself having "nothing to wear" every morning, we are here to help. We have just combed through thousands of street style images to bring you 22 of the freshest looks to try this month (and beyond) with tips on how to dress for whatever weather spring throws at us. So now there's officially no need to have a wardrobe panic. We have found a number of ensembles that will help you transition into your summer style, without having blue lips and goosebumps. Firstly, we're big fans of Gilda Ambrosio's bright blue silk jacket–and-jeans idea, as well as Nuria Val's denim trench and bell-bottom jeans look. But with other standout looks also from Lucy Williams, Sherry Shen, Jeanne Damas (plus many more), there's more than a handful of copy-and-paste options coming your way. 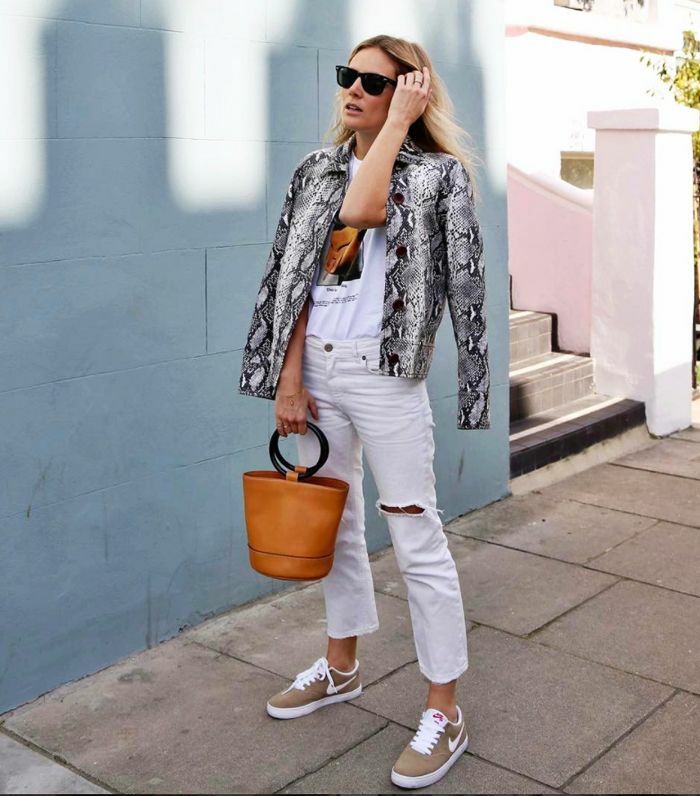 Style Notes: Nothing says summer like white denim, and we love how Lucy Williams pairs her Acne ripped jeans with a white T-shirt from Coach's Rodarte collection and a snakeskin print jacket from Ganni. Style Notes: Gilda Ambrosio's Eastern-inspired silk jacket looks striking when paired with simple blue jeans. Style Notes: The biggest trend we spied during London Fashion Week was layering dresses over jeans, and it's a clever way to wear your summer dresses all year long. Style Notes: Lizzie Hadfield pairs white H&M jeans with chartreuse suede Dries Van Noten shoes and a matching Massimo Dutti silk shirt. Style Notes: The '00s denim tuxedo is back, and we love how Nuria Val pairs her Uterque frayed bell-bottom jeans with an oversize denim trench and a simple white T-shirt. Style Notes: More proof courtesy of Roberta Benteler that white ankle boots look fresh, especially when paired with jeans. Style Notes: Sometimes you can't beat an elegant white silk blouse paired with skinny jeans and black heels—simply throw on a tougher-looking coat (if it's cold) and go. Style Notes: Sherry Shen paired her silky printed overcoat with a white shirtdress and backless black loafers—a pitch-perfect look for the office. Style Notes: For a smarter weekend look, we love Lizzie Hadfield's blue shirt with a dramatic peplum frill hem paired with ankle-skimming jeans. Plus, her black handbag with a circular clasp is only £65 from French Connection. Style Notes: For those days when the weather can't make its mind up, we love Lucy Williams's cosy Acne wrap cardi paired with Loewe espadrilles. Style Notes: We keep seeing this £26 Zara gingham skirt all over our Instagram feeds, and we love how Emili Sindlev makes it work for colder days by pairing it with white ankle boots and an oversize sky blue jumper. Style Notes: Sometimes nothing looks chicer than caramel and oatmeal hues, and we love how Jeanette Madsen updates this classic colour palette by pairing her skirt and oversize jumper with elegant white sliders and a matching white handbag. Style Notes: Giorgia Tordini's midnight-blue slip dress layered over a black mesh top looks simple, but it's impeccably stylish. Style Notes: To wear your jumpsuits when it's still a little chilly, layer them over a black turtleneck. Style Notes: Furry bags are having a moment (even Victoria Beckham is backing the trend), and they look great paired with a white T-shirt, bomber jacket and midi skirt. Style Notes: Sometimes you can't beat expensive-looking classics, such as Laura Stoloff's oat-coloured ribbed knit and striped wide-leg trousers. Style Notes: The single-earring trend is set to be huge, and this look proved that it's more wearable than you may think. Style Notes: For an update on a classic denim jacket, go for an unlikely colour like ASOS Lesley's mustard-coloured style, which she found in the menswear department. Style Notes: Pink and red is one of the key colour combinations for this season, and Tamu McPherson shows it looks especially striking when styled with clashing tailored separates. Style Notes: To wear your tops with statement backs before summer kicks in, wear it over a roll-neck. Style Notes: One of the biggest catwalk trends for this season was clashing statement prints, and Kate Foley shows that when it comes to styling this trend, more is certainly more. Style Notes: Checked blazers are the one item you'll find everywhere this spring from Balenciaga to Zara, and we love how Yoyo Cao pairs hers with an equally preppy blue-and-white striped shirt. Next up, the 29 best summer dresses known to man.